Rock Stars® are specially selected plants that all share one thing in common: they're little, they're tough and they're cute! While many of these are traditional rock garden or alpine plants, we've made the job easy for you by trimming out the kinds of alpines that are fussy-to-grow and temperamental. By carefully assessing and eliminating the tricky types we're able to offer you a wide selection of solid performers that are the true stars of the rock garden! You don't even need rocks to grow Rock Stars® either, as you'll see. Alpine plants have naturally evolved to cope with the extremely tough conditions that exist in high mountain regions across the globe. Many of these are small in stature, huddling down among the rocks for protection from harsh drying winds, scorching sun, bitter winter cold, short summers and hungry mountain goats! Not all alpines make the transition to lower elevations easily – a good many are a challenge to grow, requiring specialized sites or alpine greenhouses, but not Rock Stars®. We think most gardeners should enjoy success with these little guys with a minimum of fuss. Some Rock Stars® even thrive on neglect under the brownest of thumbs. They may be small, but they're tough and resilient! Under normal conditions, our Rock Stars® should stay small too. We've selected only plants that grow to a maximum height of 12 inches (30cm) though some kinds are a lot shorter than that. And many of these plants are drought tolerant too. Rock Stars® come in different shapes and sizes, and it's a good idea to choose a variety of distinctive types when you start a collection. We've divided them into six categories. Click on any to see examples: Carpet, Spreader, Tuft, Cushion, Rosette and Subshrub. What's with this Easter Island dude? His name is Cliff. Cliff is cool. 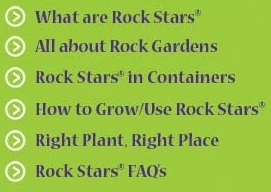 He knows he doesn't need to worry about his garden, because he's chosen Rock Stars® to grow in the cracks and crevices between all the boulders in his island back yard. He tried growing petunias and marigolds, but they didn't seem to do anything. There were too many rocks to even think about growing a lawn. Cliff looked long and hard, and tried a whole lot of different plants before he discovered that Rock Stars® were the perfect answer, and they didn't require a whole lot of attention and fussing. 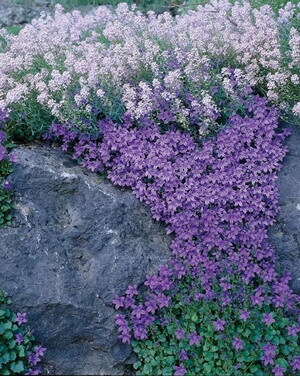 Now Cliff has the best-dressed rocks in the whole neighbourhood, and he doesn't even miss having petunias. Not much is known about the mysterious Easter Island inhabitants, but archaeological evidence suggests they actually did make extensive use of rocks in their food production gardens. We chose Cliff to represent Rock Stars® because of this fact but also because Cliff is cool!